Many patients experience anxiety about visiting the dentist, and that anxiety is often heightened when a patient is scheduled to undergo a dental procedure. Fortunately, there are many anesthetic options to help relieve pain and anxiety, and ensure a comfortable and worry-free treatment experience during even the most complex of dental treatments. The STA Single Tooth Anesthesia System® unit by Milestone Scientific is an award-winning technology that administers, as the procedure is taking place, precise amounts of anesthesia that target only the area being treated. With the STA system, anesthesia is delivered through a tiny needle that is much smaller than the one typically used. The STA needle provides precise placement of the anesthesia and, for most patients, is less painful than typical needles. The effects of the injection are felt right away, and the system’s computer continuously releases small doses of anesthesia throughout treatment. 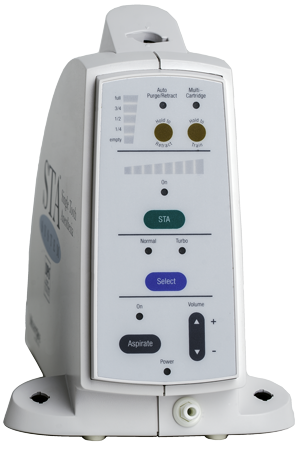 This STA system provides instant, predictable anesthesia. And, rather than the full-face numbness that typically results from dental anesthesia, the STA system enables only a single tooth or area to be numbed. As a result, patients can quickly resume speaking, eating and drinking.